Senior Sarah Seeman’s passion for tennis took her from the indoor tennis courts of Port Washington, New York, to Southern California to pursue her goal of playing collegiate tennis. Although the expectation to become what is considered a “great” tennis player was low when she began her career as a competitive player at the age of 12, Seeman was dedicated to thriving as an athlete. “I am…self motivated, but also having a lot of girls on the team who are all so nice, I feel like we all motivate each other to do well. The environment Coach Mike [Gennette] created really is an environment that is motivating,” Seeman said. As a child, Seeman was involved in various activities such as dancing and softball. It wasn’t until she picked up the tennis racket at the age of 12 to play with a family friend and tennis coach that she found her passion for the sport. “I did not want to go to school in the East Coast because you play indoors all the time… and I love just being outside playing, which is something my parents noticed and also why they supported me on my way to California,” Seeman said. Seeman said there were times when she “didn’t feel good enough” to play at the collegiate level. Looking back at her four years of being a starter on a Division-III team, she said she realizes that she has achieved her goals and more. Seeman was inducted into the Scholar Athlete Society of 2018, nominated for Scholar Athlete of the Year this spring and has a 2-1 winning record during her last three seasons. Seeman is also an avid reader. She said she accomplished her personal goal of reading 25 books last summer. 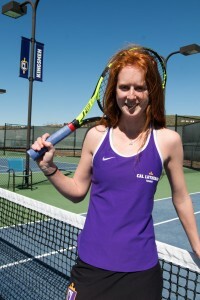 Aside from her love of tennis and reading, Seeman also has a passion for her major, psychology. She hopes to follow her family’s history in the medical field and receive a Doctorate in Nursing Practice (DPN) under the title of psychiatric nurse practitioner. Mike Gennette, head coach for both the men’s and women’s tennis program, has been at the university for 26 seasons. Although he is much more familiar with the men’s tennis program, Seeman said he has created a welcoming community for 14 members of the women’s team during his second season coaching them. Gennette said he sees Seeman as a leader and example-setter. He said he hopes newcomers to the team are inspired by her work ethic and passion for tennis. “I really respect her. The commonalities that we have that I really like is that we both want to find out more, learn more, share more and teach more people that need help and I see that on the court with her,” Gennette said. “Having [Seeman] as a teammate and a senior leader has been really awesome. She is always supportive and encouraging me and many other freshman. She is always bringing the energy up at matches and bringing excitement to the courts. She always puts effort into making sure everyone is okay and she is always there for you if you need her,” Foreman said. Although this is Seeman’s last year at Cal Lutheran, she hopes to continue down the path of receiving her degree and being able to help and inspire more people outside of the tennis world.